I can't believe that it's been a week since we last saw each other - my fault, I'm afraid. Between house sitting, a pulled tooth & misplacing my camera, I have not had much time to play, sing, dance or bake in the kitchen. Luckily I know some fabulous food bloggers who are willing to step in and keep une gamine going; and my camera was discovered hiding inside the bowl of my stand mixer (apparently after enough wine, a silver bowl bears a striking resemblance to a wooden cabinet). Last December I did a guest post on Roxana's Home Baking. Today I'm more than happy to have Roxana on une gamine Until I'm elbow deep in flour and sugar again, I'm positive that her delightful Cadbury Creme Egg brownies will satisfy your sweet teeth! Hello! I’m Roxana, the wanna be baker and photographer behind Roxana’s Home Baking. My blog is focus on baking everything from scratch. I’m a self-taught baker, learning more with every cup of flour I use. Most of the recipes found on my blog rely on simple techniques everyone can master with a little bit of patience. I also have a big sweet tooth, easily noticeable through the hundreds on desserts recipes I've shared. I may have a slight addiction to chocolate. 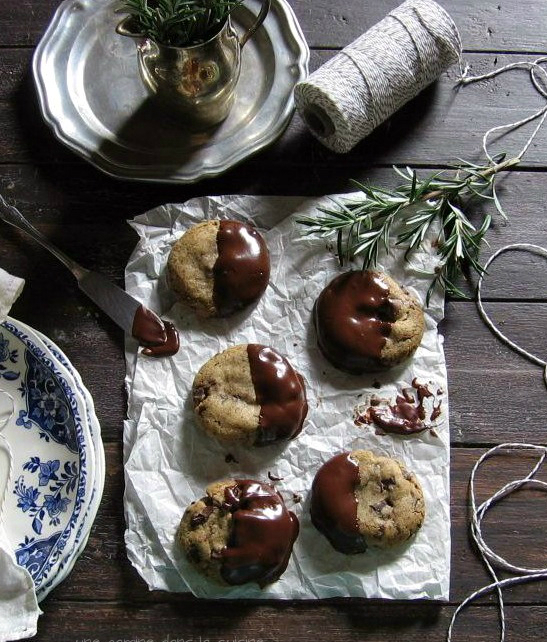 After all, homemade chocolate goodies are the best medicine. 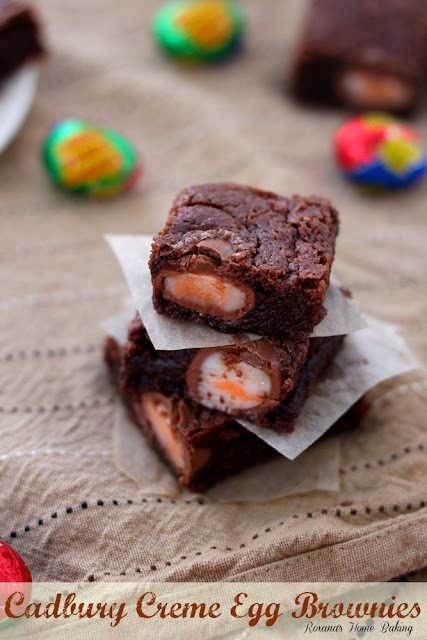 I'm happy to be here today on Valerie's blog sharing the recipe for rich, fudgy brownies with Cadburry Creme Eggs. If I have to pick one Easter candy i look forward every year it would be the Creme Eggs. I love the creamy fondant hidden inside the chocolate-y shell. After eating lots a couple of eggs the idea of mixing them with a rich chocolate-y brownie was getting stronger and stronger. I was dreaming about these brownies. I knew there's no going back. I had to make them. Just imagining them was not sufficient for my sweet tooth. To melt these brownies you start with melted chocolate. Everything that starts with melted chocolate is a winner in my books! While the chocolate is slightly cooling, cream the sugar and butter. I've used brown sugar for a little extra flavor. Mix in the chocolate, egg and flour and spread the thick batter on the bottom of a baking pan. Time to unwrap the creme eggs and press them inside the brownie batter. I've used mini Cadburry Creme Eggs, the regular size being a little too big. Bake, let cool and enjoy. It's that simple! The results are out of this world good. The outside forms a thin hard shell, the best part of the brownie if you ask me, and the inside it's rich, fudgy, irresistible and totally addictive. The Cadbury eggs soften but still hold their shape inside the brownie bars. Heat the oven to 350F. Line an 8X8 inch baking pan with parchment paper. In a microwave safe bowl place the chocolate chips. Microwave, 30 seconds at a time, until melted. Stir to combine. Set aside. In a mixing bowl, cream the butter and brown sugar until light and fluffy, about 2 minutes. Pour in the melted chocolate and keep stirring. Slowly add the flour mixed with baking powder. Spread the batter on the bottom of the prepared pan and press in the Cadbury creme eggs. Bake for about 30 minutes or until the top is set and firm to touch. Let cool completely before cutting into bars. Enjoy! Thank you Valerie for letting me blog-sit today. If you liked these Cadbury creme eggs you can subscribe via email to get future updates straight to your inbox. Roxana you're making me crave brownies for breakfast! They look so moist, rich and perfect! Mmmhhh, terrific! Those ,oist brownies are ever so tempting. At first I didn't realize it was a guest post and was so confused by the photos... love that your style is so distinct. Great guest post, though. Those brownies could cure my current chocolate craving. Cadbury Creme Eggs are my daughter's absolute favorite Easter candy. She would love me until the end of time if I ever made this recipe for her! Great collaboration between you and Roxana, Val!!! 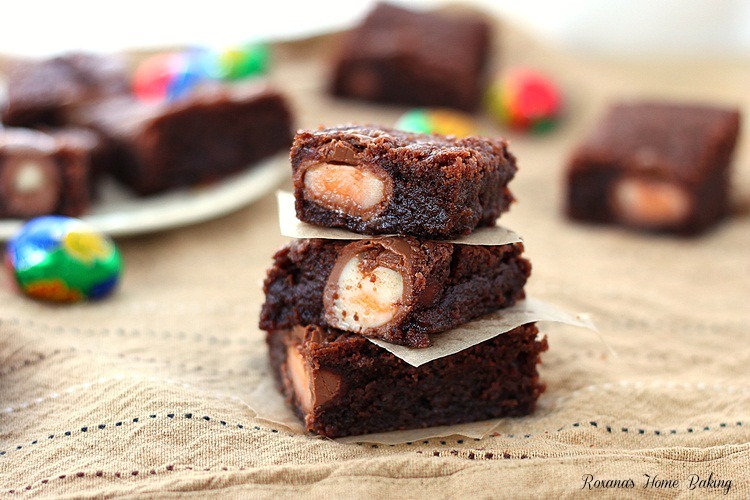 Brilliant idea Roxana-love a simple brownie recipe that has such a fun candy filled twist! Your camera in in your stand mixer--too funny! So nice to see Roxana here. Love the brownies! I guess with cell phones getting smarter and smarter we will have to watch out for them trying to get away. Thanks for having me on your blog today. I'm truly honored. 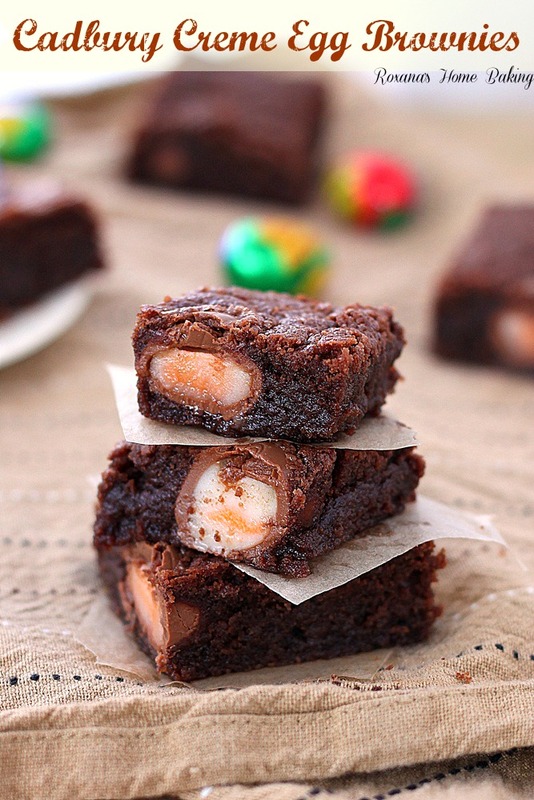 The brownies look scrumptious, would be a nice addition to chocolate Easter egg basket. Cadbury creme eggs are my most-looked-forward-to holiday candy. I love that there are whole eggs hiding in these!! Sorry to hear about everything you've got going on, Valerie. I hope your mouth is feeling better soon. 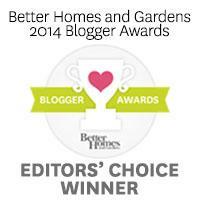 In the meantime, what a fabulous guest post! Those brownies look perfect. My hubby adores cadbury eggs! This would be a special treat for him. What a great recipe and guest poster. Happy Saturday Valerie! Oh my! These brownies look so fudgy and delicious! Yum! I'm never that sure about creme eggs - I find them seriously sweet and rich - but squidged into a chocolate brownie like this I think I could definitely learn to love them! And these look deliciously sinful, Roxana! I haven't had a Cadbury egg since I was little and have completely forgotten what they're like but I bet these are perfect in every way! I can't tell you how many of them I eat. Next time you make brownies add in the Reese's PB eggs. OY! these are so sinfully delicious, love it! These have to me the most amazing sounding cookies. Cadbury eggs are my favorite. Is it possible to substitute the chocolate chips with coco powder? If you can't find chocolate chips, try looking for Baker's chocolate (usually sold in 8oz packages). Oh my goodness, these look amazing! I love Cadbury eggs, and putting these in brownies would be certainly delightful. Found this recipe through Pinterest and made it tonight to bring to a birthday/Easter celebration. I haven't tasted it yet but it looks and smells divine! Thanks for posting the recipe! I did your brownies here! Thanks!